Morso Model F Mitre Machine. 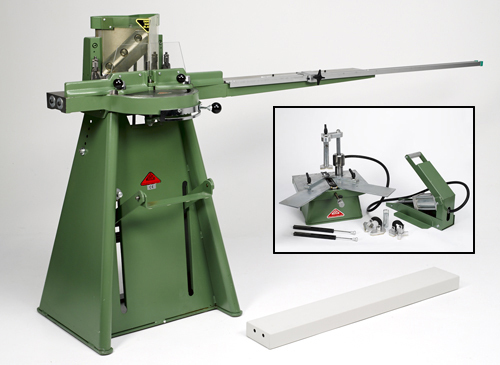 This machine has foot lever operated blades and cuts a double mitre at 45° and single mitre up to 90°. Tenon, Mortise joints and a variety of angled cuts can also be made. Cutting width is a maximum 100 mm and Cutting height is a maximum 160 mm. Waste material drops down a chute at the rear of the machine into a small bin or basket. Also supplied is a Side Table Extension. Morso UP-M Tabletop Hydraulic Frame Underpinning Machine. This Machine is a manual bench model which is operated by single pressure with a hydraulic foot pedal. The Morso Model UP-M is perfect for a small workshop. Supplied with 10mm and 7mm Cartridges plus Wedges. These machines are virtually as New and in Mint [-] condition and are perfect for the business of picture frame making. Please Note: These machines are very heavy approx.150kg and collection using a van is recommended. Please contact us for details and options.